Pearson EasyBridge: It’s Easy to Bridge Your SIS with Pearson Platforms. Simplify your classroom rostering with one of the three EasyBridge options. EasyBridge is included in your school or district’s Pearson digital program subscription. Pearson EasyBridge Auto or EasyBridge Plus requires the assistance of a Pearson team to initially implement the solution for your district. Districts that are not EasyBridge Plus or EasyBridge Auto are, by default, EasyBridge Basic.Your Pearson account general manager can help you decide which option is best for you. Locate your Pearson contact now. 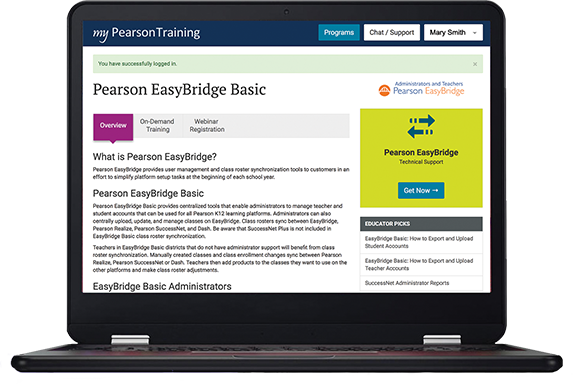 If you use Pearson learning platforms, then you are also an EasyBridge customer! School and District personnel responsible for rostering should visit PearsonEasyBridge.com to login or for announcements, training and support. EasyBridge Basic requires an administrator or “account gatekeeper” to help register teachers for new accounts. For more information about the gatekeeper and the teacher registration process, click here. Teachers who need to manually register for their Pearson K-12 programs can find helpful tutorials and on-demand training free at MyPearsonTraining.com. Also find video tutorials and full technical support 24/7.